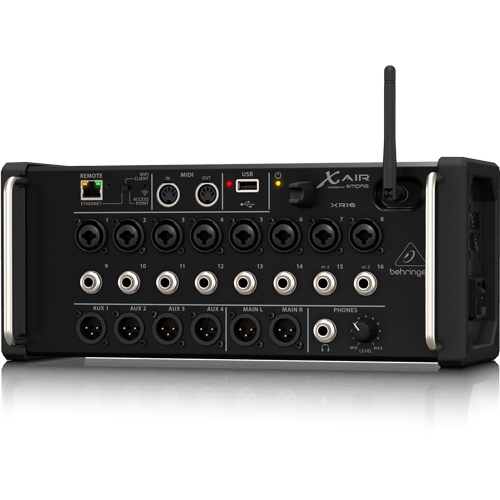 16-Input Digital Mixer for iPad/Android Tablets with 8 Programmable MIDAS Preamps, 8 Line Inputs, Integrated Wifi Module and USB Stereo Recorder. The REVOLUTIONARY XR16 is a small, but incredibly powerful, rack-mountable mixer that will forever change both the way you record – and the way you play live music. It comes with rack ears and protective bumpers for added flexibility in your studio and stage applications. • Built-In Tri-Mode Wifi router for direct operation. • Award-winning X32 effects rack feat. 4 stereo FX slots including high-end simulations such as Lexicon 480L and PCM70, EMT250 and Quantec QRS etc.